Elected a Master Pastellist by Pastel Artists Canada in 2008, he is a Signature Member of the American Impressionist Society, the Pastel Society of America and a juried member of Oil Painters of America. 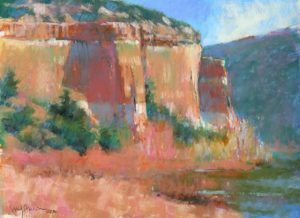 He is the author of Backpacker Painting: Outdoors with Oil & Pastel and Through a Painter’s Brush: The American Southwest. A long-time contributor to The Pastel Journal and Contributing Editor for The Artist’s Magazine, he teaches plein air painting workshops across the US and seasonally in New Mexico and Maine.